These days there’s lots of sleaze around, and one place where it annoys me is at the domain registrar GoDaddy.com. I’ve used them forever it seems — back when I saw their ad on AltaVista’s search engine. These days, though, I find their marketing to be sleazier than I appreciate. On top of that I’m not interested in paying the rates they require to keep your domain private, and for my new domains I’m interested in simple email setups and such. 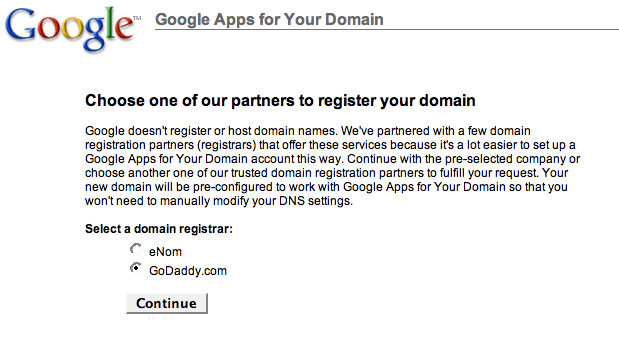 So Google Apps for Your Domain fits the bill quite nicely. It’s $10 per year, you get a GMail-ish setup plus more, and I don’t have to use GoDaddy.com. I haven’t yet signed up with eNom for anything. I plan to purchase my first domain from them (via Google Apps) tomorrow. I may not be able to move all of my domains right away, but I think that by pushing my money to someone else that’s less offensive I’ll feel better about what it gets used for in the end. It’s small, but it’s one simple way to start standing up against the sleaze of the day.